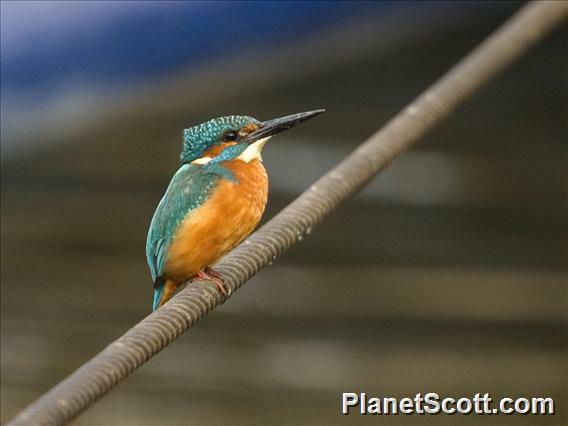 The kingfisher feeds mainly on fish and invertebrates, which it catches by perching on a convenient branch or other structure overhanging the water, and plunging into the water when suitable prey comes within striking distance (2). If a suitable perch is not present, individuals may hover over the water whilst searching for prey (2). During the breeding season, pairs perform a display flight whilst calling. The nest consists of a tunnel in a riverbank or amongst the roots of a tree; both sexes help to excavate the tunnel, which terminates in a rounded chamber. In April or May 6-7 whitish eggs are laid on the bare earth, but after some time regurgitated fish bones form a lining to the nest chamber. Both parents incubate the eggs for 19-21 days. The young fledge after around 23-27 days, before this time they may eagerly approach the entrance of the tunnel when waiting to be fed (4).